The latter is the research focus of Pablo Monsivais, Ph.D., MPH, an associate professor in nutrition and exercise physiology in the Elson S. Floyd College of Medicine. 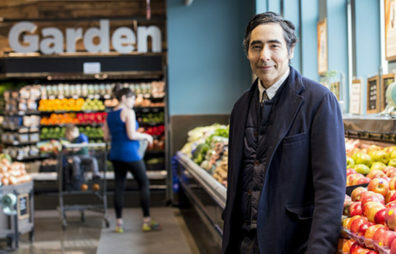 He studies how social and environmental factors influence people’s eating habits, exploring associations between diet and factors such as income level, employment status, and neighborhood access to different types of food outlets. Monsivais recently joined WSU from the University of Cambridge in the United Kingdom. While there, he led several studies related to the Dietary Approaches to Stop Hypertension (DASH) diet, an evidence-based, balanced eating plan designed to promote healthy blood pressure. Using data from UK cohort studies and surveys, he and his team found that people who ate out more were less likely to have a DASH-accordant diet and more likely to be obese. Further analysis of the data by type of food establishment showed that their finding was only significant for fast food outlets. In another study that examined supermarket accessibility, they showed that people who lived farther from a supermarket or had a limited budget for food were less likely to consume diets consistent with the DASH dietary pattern. Interested in contributing to research at WSU Health Sciences Spokane?